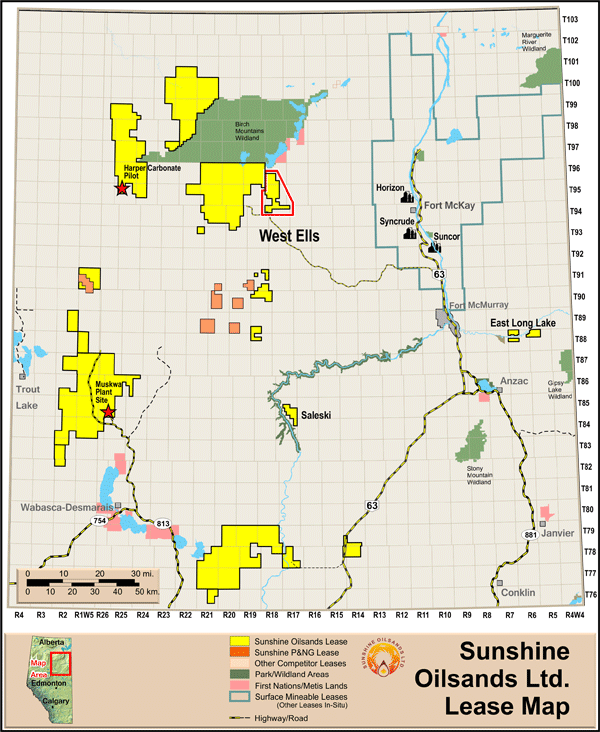 Sunshine's West Ells location, which began construction of a 10,000-bbl/day commercial SAGD facility in October 2012, is scheduled for first steam in 2015. 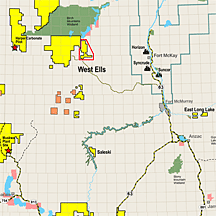 The West Ells region covers 9,856 contiguous gross and net hectares and is located within the Athabasca oil sands region close to several high profile international oil companies. Photos updated March 27, 2015. With the completion of an all-season road at the end of September of 2013, which provides full access to the West Ells facility location, construction began on October 2, 2012. The first phase of the West Ells SAGD project will proceed in two phases of 5,000 bbl/d each. Modular expansions will increase production in phases. West Ells is expected to be capable of producing greater than 100,000 bbl/d of bitumen from the Wabiskaw zone over a period of 18 years with a productive life of over 50 years. The projected "first steam" date for Phase 1 is expected in 2015, with phase 2 being commencing shortly thereafter.